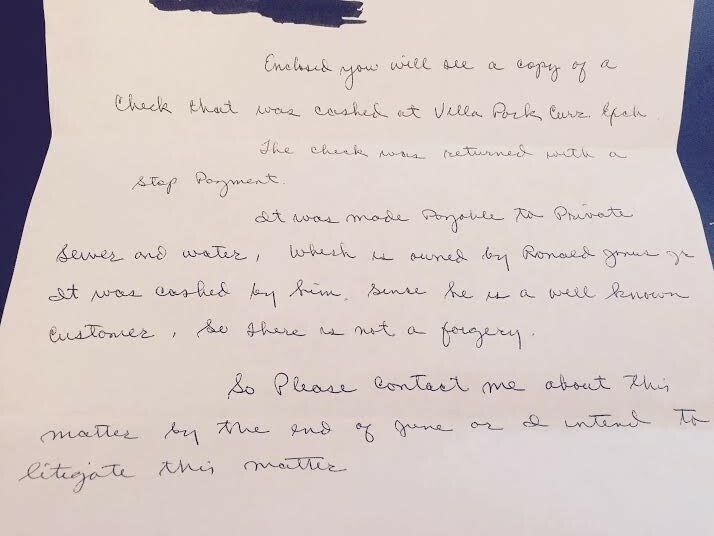 Private Sewer and Water Scammed Me: Another one of Ron's victims comes forward. Another one of Ron's victims comes forward. I recieved an email a few days ago from another one of Ron's victims. I have PLENTY of info on this SCUM and he still does have his business in Addison, I also was contacted by currency exchange he CASHED my check at, and yes The reviews online YELP, Citysearch, and many OTHERS are all FAKE reviews he had someone do for him. He is over a year in the rears with the property he rents in Addison for his business and owes ALL of his employees weeks in back pay. Long story short he knew my late husband and I needed work done and called him thinking he would be "safe"
They followed that up a few days latter with a picture of the letter that they recieved from Ron. Enclosed you will see a copy of a check that was cashed at Villa Park Curr. Exch. The check was returned with a stop payment. It was made payable to Private Sewer and Water which is owned by Ronald Janis Jr. It was cashed by him. Since he is a well known customer so there is not a forgery. So Please contact me about this matter by the end of June or I intend to litigate this matter. Sounds like the currency exchange guy was originally pissed at the customer for stopping the check, but then realized he was dealing with a scumbag who was probably taking advantage of people. What I don't understand is what Ron does with all the money. He should be rolling in it. He takes large sums of money from his customers and doesn't do the work to ear it. Apparently he doesn't pay his employees, or his rent or his bills, so where does it all go?